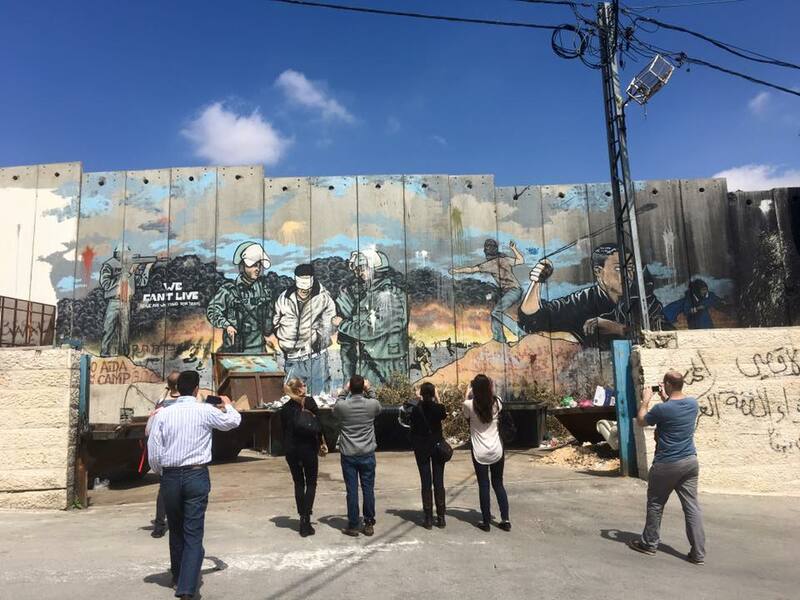 This exclusive Ramallah, Hebron and Bethlehem Tour “The Classic” will begin by having you picked up on time at the requested location, by a private air-conditioned executive vehicle and I will be honored to spend the day and share with you the reality of Palestine. Traveling north, we will pass and see the East Jerusalem neighborhoods of Shufat, Beit Hanina, Dahiyat al-Barid and continue driving along the east side of the Separation Wall to cross the Qalandia checkpoint and enter the West Bank (WB). Driving along the WB side of the Wall, we will stop to visit Al-Ram and the other side of Dahiyat al-Barid to get acquainted with the difficulties faced by the local residents of the area. Discovering how the Wall has created tremendous barriers, affecting the lives of the Palestinians, we will continue traveling north to visit the beautiful City of Al-Bireh, which is actually where my mother was born. Visiting a political site that visibly demonstrates the presence of the occupation, we will understand the negative aspects it has on the Palestinians throughout the entire WB. In Al Balou, we will also see the presence of the Beit El settlement, strategically situated on confiscated WB Palestinian land and continue to visit the PLO Building, Mukataa (The Palestinian Authority Headquarters) and Yasser Arafat’s mausoleum, where he has been laid temporarily until he may be buried in East Jerusalem upon his request. Moving along, we will partake in one of the highlights of my tours, experiencing while wondering how the residents of a refugee camp in the WB, are able to survive living under the hardest possible conditions. We will meet with residents of the camp and walk through the narrow streets and alleys, while learning of their origins and hearing stories of their life under occupation. Gaining memories to last a lifetime, you will also discover that the Palestinians are still optimistic about the future and continue to hope and pray for peace. After our visit to the camp, we will drive to downtown Ramallah and enjoy walking in the streets of the city center, around the Al Manara Square and through the fruit and vegetable market, which offers produce from all cities across the WB and even Israel. Along the way, we will enjoy several stops with plenty of options, tasting the delicious Turkish coffee, Shawarma, Rukab’s famous ice cream and even a traditional Palestinian meal. After lunch, we will walk to the Old City of Ramallah and admire the historical buildings that date back to the British Mandate and Ottoman Era. Traveling south to Hebron, we will stop along the way to visit the Natsheh glass factory, famous for their hand blown glass. Discussing the importance of our visit to Hebron, known to be the largest city in the WB, we will find ourselves walking in the streets of the center towards the Old City. Gaining knowledge of the conflict, we will visit with a friend of mine, who will kindly share with us his struggles as we stand on the rooftop of his home overlooking the Old City of Hebron. Through the narrow streets, we will approach and visit the Ibrahimi Mosque/Tomb of the Patriarchs and understand why it has been the center of conflict. On our way out of Hebron, we will have the option of either stopping at the Herbawi Kuffiya factory, (famous Middle Eastern cotton scarf) or continuing the excitement and heading towards Bethlehem. Entering Bethlehem, we will visit the Aida refugee camp, see the Jacir Palace hotel and then walk along the Separation Wall to admire Banksy’s courageous artwork and “The Walled Off Hotel.” Standing steps away from the birth place of Christ at the Church of the Nativity and Manger Square we will make a wish for peace. We will end the tour by driving back to the initial agreed upon location, where you will be dropped off with a smile, having gained a raw and authentic lens of the difficult political and emotional terrain of Palestine and Israel.